There’s often a good deal of lag time before concepts that originate in the academic field make their way into the business world (and sometimes it goes vice versa as well). This is the way of snowball sampling in sociological research, and I think it can be applied in a way to extend the reach of your eLearning efforts. The way snowball sampling came about was back in the 1940s when Robert Merton was trying to figure out how to get a sample of opinion leaders and their followers. Standard methods for random sampling wouldn’t work because such pairings would rarely appear, if ever. Instead, Merton recruited an initial sample and then asked them who had influenced them, and this became the next wave of recruits to be involved in the study, creating a snowball effect. From an academic point of view, there are problems with snowball sampling because it introduces biases not present in completely random sampling. However, it is an incredibly useful sampling technique when you want to study groups of people who are difficult to access and who generally don’t want to be studied for one reason or another – think gang members, drug addicts, or any group who might balk at researchers coming in to study them – but if someone they know says they should do it, this can really open things up. If there’s research to do that involves your employees, consider snowball sampling that keeps the referrals anonymous as a way to help facilitate it. I also think that this snowball effect can be leveraged to extend the reach of eLearning efforts. In one sense, it’s really not anything different than good old fashioned word-of-mouth advertising. But I also think there’s a more nuanced aspect to this that not many have thought about. Let’s say you’ve developed an eLearning module on some particular skill that seems to be lacking among many of your employees and that you want to enhance through this learning effort. Not every single person in the organization needs this, but leaving it up to each one to decide means there’s probably going to be quite a few people who don’t think they need it when they really do. What I’m suggesting is that you use a snowball sampling technique to build the ranks of people taking the course. Starting with the eager beavers who sign up to take it right away because they both realize they need it and want to improve in it, you ask them to basically “sell” this eLearning course to others who they think need it. Obviously, if it were a module about active listening, you don’t want your initial wave out in the workplace calling people out because they’re terrible at active listening. Subtlety is the key. What they should be highlighting is how valuable the course was to them, even when they thought it wouldn’t be (and yes, this is all based on the assumption that you design really exciting, engaging, compelling eLearning programs). 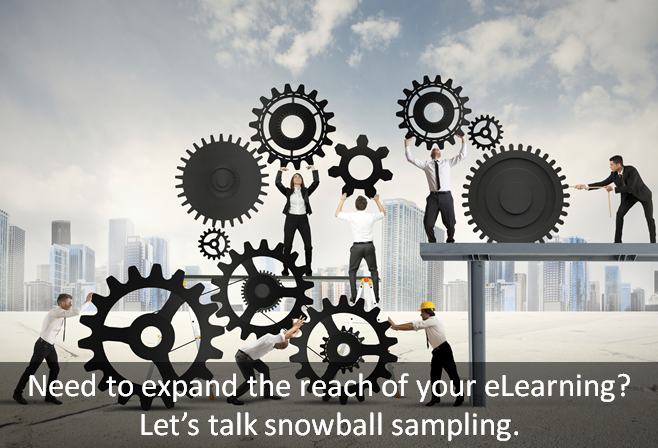 Academic studies of eLearning have already successfully used snowball sampling as a way to enroll participants into the course being studied, so we already know it can work for eLearning recruitment. The next step is to apply it specifically in the workplace eLearning environment.